Through the ages, mankind has been faced with difficult choices: paper or plastic; Mary Anne or Ginger; Almond Joy or Mounds. One of these disputes that has yet to be settled is who gets the heavyweight bagel championship title or earns the right to call themselves the crowned prince of Montréal-style bagels. 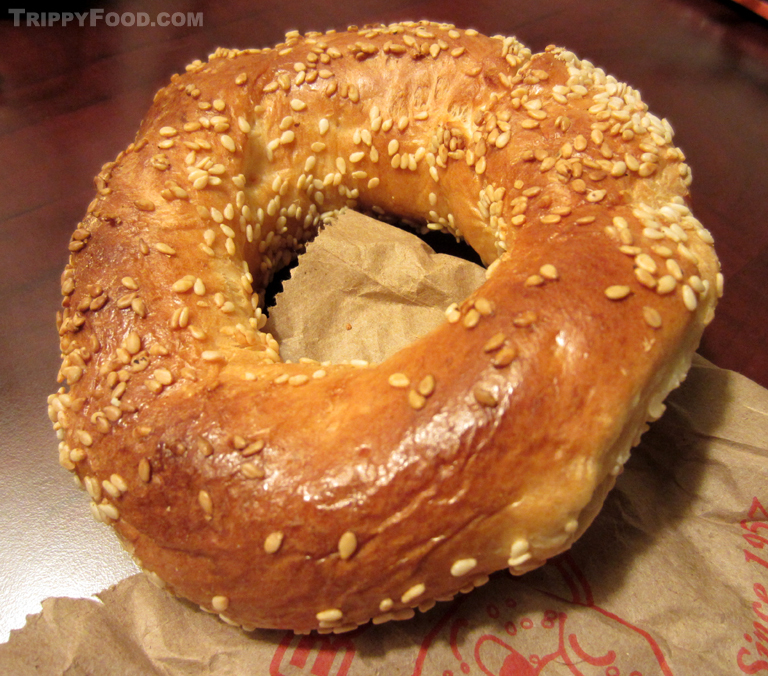 If you're unfamiliar with the genre, the Montréal bagel is a whole different animal; they bear little similarity to their Big Apple cousins to the south. 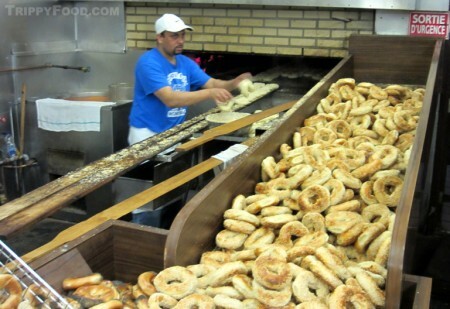 The dough wheels are hand-cut and joined, making them lumpy and irregular in shape; the water they are briefly boiled in (and the bagel dough) is sweetened with honey, giving the finished product a cake-like taste and consistency, partially due to the reduction of salt in the manufacture. 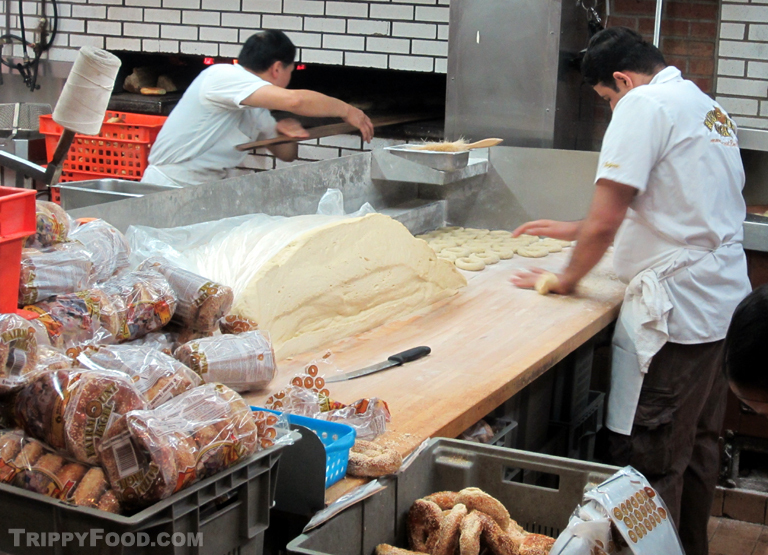 Montréal bagels are typically baked in an open wood-fired oven that could easily bake a pizza the size of Rhode Island and usually the manual assembly line process is all performed out in the open and around the clock. Although the heavy hitters ship their product throughout Canada and the U.S., there is no experience quite like queuing up to get a hot one right out in the oven with its slightly charred crust enveloping the soft, spongy goodness within. Runs of specialty bagels (cinnamon raisin, blueberry, etc.) are made at various times during the day but for the most part, three varieties are churned out en masse: sesame seed, poppy seed and plain. It isn't well known who introduced the bagel from Eastern Europe to Montréal, but most historians attribute the first commercially available bagels to either Chaim Seligman, who originally sold his bagels from a cart and then later moving into a brick-and-mortar next door to Schwartz's Deli or bagelmeister Isadore Shlafman, who had been making bagels in Montréal since 1919. For a while Seligman partnered with Mayer Lewkowicz and Jack Shlafman (son of Isadore Shlafman), but the trio split into competitive factions - Seligman and Lewkowicz (who later founded Saint Viateur Bagel Shop) and Shlafman (who took over Isadore's Fairmount Bagel). Although there are a baker's dozen of decent bagel shops in Montréal, the forces to be reckoned with are the two old timers. The Shlafmans had been bageling for about 30 years before Isadore knocked down the walls on the first floor of a home at the current location on Avenue Fairmount and installed the gigantic oven in 1949. The entrance to the round-the-clock operation is located at the original front porch of the house; once inside, the queue starts in the cramped customer space where patrons can watch the full production of bagels - while one baker is cutting and forming bagels from a coffin-sized mound of dough, another is boiling the bagels, rolling them in the appropriate accoutrement and feeding them into the oven's gaping maw on what easily looks like a twenty foot long wooden oar. Once the fleet of bagels have been flipped to toast evenly, they are tossed into a giant bin where they are bagged, or (if the temptation is too great) quickly transferred from the bin into your eager hand while still piping hot. The process of removing the bagels from the oven is quite the spectacle - some of the bakers have developed a spectacular flip of the wrist that transfers the bagels from the "bagel peel" into the bin in a high sweeping arc with nary a baked good missing its target. St-Viateur Bagel is approximately the same size as Fairmount Bagel, but it has resided in an old storefront with huge picture windows where you can watch the bagel manufacture from outside. Like Fairmount Bagel, St-Viateur operates around the clock, baking and bagging thousands of bagels daily for shipment; there are three other bakeries in addition to the original location as well as a couple of cafés in Montréal. Bags of St-Viateur Bagels emblazoned with the lumpy, misshapen bagel-man mascot are available throughout Québec Province, stuffed into baskets at Marches Atwater and Jean-Talon, stacked and at the ready for sandwiches at Bagel Bar at Montréal-Trudeau Airport, and even available in the gourmet epicurean grocery J. A. Moisan in Québec. 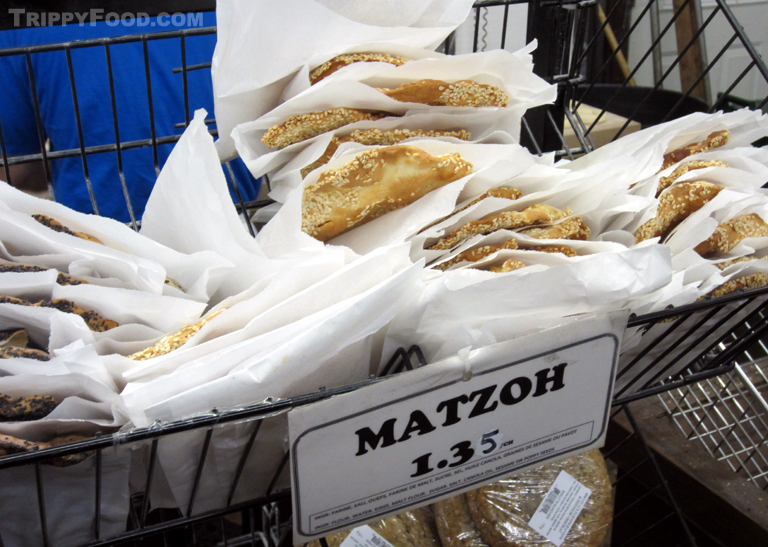 St-Viateur Bagel appears to have a fairly large orthodox clientele, and it's not uncommon to see patrons in payot and beard come in for freshly baked matzo. 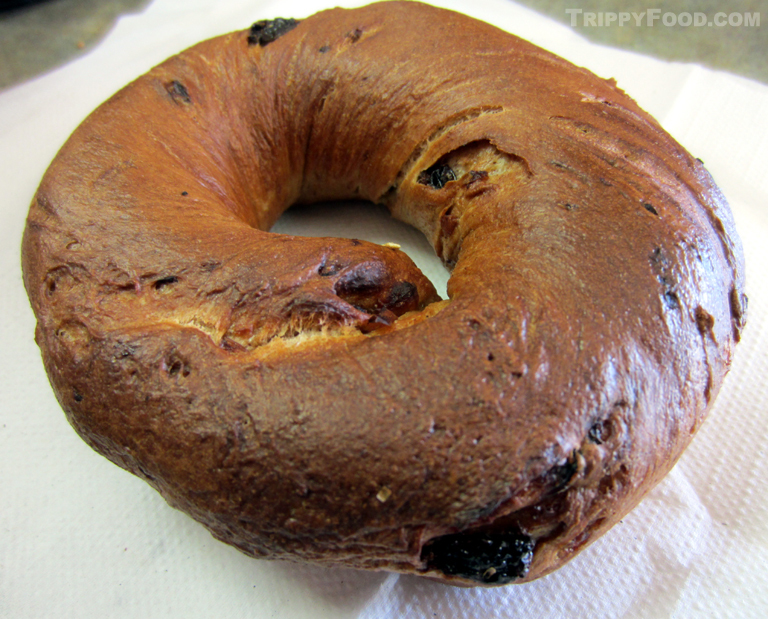 A sample of the three traditional bagels (black, white and plain) at St-Viateur Bagel demonstrates that although the product is the same, the taste is different. This entry was posted in Montréal and tagged Airport, Avenue Fairmount, ayer Lewkowicz, Bagel, Bagel Bar, bagels, Canada, Fairmount, Isadore Shlafman, J. A. Moisan, Jack Shlafman, Marche Atwater, Marche Jean-Talon, Montreal, Montréal-Trudeau, oven, poppy seeds, poppy seedsBagel, QC, Quebec, Saint Viateur, Schwartz's Deli, Seligman, sesame, St-Viateur, wood-fired. Bookmark the permalink.